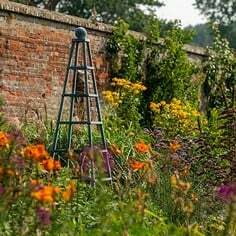 If you’ve done your homework, then the kitchen garden in high summer is a relaxing place to be; irrigation kits deliver essential water to thirsty plants; various grades of netting keep pests of all description away from your crops and the plants in general thrive in the warm, sunny weather. 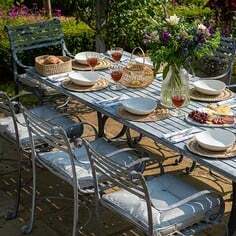 All the gardener needs to do in addition to relaxing on a sunlounger is a spot of weeding and quite a few sessions of harvesting. Sounds idyllic! But that’s certainly not my style! 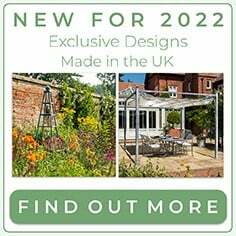 Not content with overseeing the production of our latest catalogues, I’ve been dashing around the country in search of new and innovative garden products and ideas – and if I can’t find what I’m after, I’ve been designing it myself! All this rushing around and developing new products is kind of an excuse for an amalgamated mid-summer update from Stephanie’s Kitchen Garden, but as I’m about to bring you details of a brand new tomato support system, a great way to protect your peas and my solution to the strawberry shortage so far this year, I’m sure you’ll forgive me...! 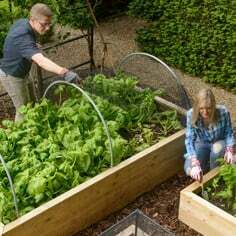 Know your enemy is a common creed which certainly has a place in the garden environment, and being aware of which pest has designs on which crop is a great help when it comes to crop protection. The only problem is - I wish the pests would make up their minds! I’ll explain; I’ve grown peas in Stephanie’s Kitchen Garden every year since its creation and the local bird population have barely batted an avian eyelid in this time, let alone shown any inclination to dine out – until now. Our feathered ’friends’ have turned their beaks to my peas this year and after plenty of hard work sowing and planting the crop – even using the highly-rated guttering technique – it got my back up! That’s why the strange sight of trainee horticulturist Courtney and I assembling an aluminium tubing/build-a-ball frame around the pea and bean frame – itself situated in a raised bed – and covering the easy-to-erect frame with anti-bird netting greeted the on-looking Stephanie’s Kitchen Garden birds one morning earlier this month. Being of a practical persuasion, I identified that the versatile tubing and connector combination could add another use to its expanding portfolio and the result is more fresh peas for me! Thoroughly delighted with my handiwork, I’ve got a supply of tubing and build-a-balls on standby which I can press into emergency use at the first sign of any further problems in the garden! I’ve nothing personally against mice – they’re small, furry, quite cute and generally cause me little trouble – but when they start eating my peas before I get the chance, then they’ve crossed the line! 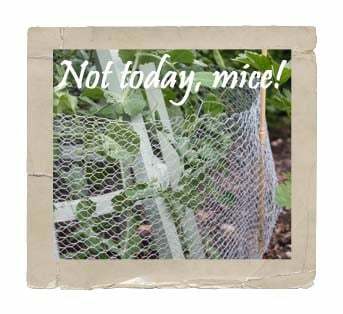 Maybe it’s the harsh winter but I‘ve experienced more mouse mayhem in Stephanie’s Kitchen Garden than in any previous years, and some of my gardening friends have reported similar rodent-based problems in 2010. Focus of their sharp eyes and teeth are my peas once again, but they’ve diversified from the raised bed crop to the Sweet and Sugar Snap peas I’ve carefully trained up some teepee obelisks. After my patience was tested by birds devouring my peas, I was in no mood to take this further example of legume vandalism from the mice so I established my own ‘ring of steel’ around the base of each teepee with multi-purpose galvanised rabbit wire. A barrier 50cm in height - doubled up to even further reduce the 12.5mm mesh - seemed to do the trick and also didn’t impinge on the graceful lines of these structures – another successful example of ad-hoc pest control. With the peas romping unchecked up the obelisk, it’s time to remove the wire but rest assured I’ll be keeping these mini high security fences handy for next year! Butterflies next and most gardeners will know they’ve got a penchant for laying their eggs on brassica leaves - and when those hungry caterpillars hatch out, they’ll waste no time in turning the juicy green leaves of your broccoli, Brussels, cabbages and calabrese to a skeletal mess, not to mention dropping frass (it’s not nice!) over everything. Desirable? I don’t think so! The key to caterpillar control is to stop the butterflies laying their eggs on the leaves of brassicas and a frame (it’s that trusty old aluminium tubing/build-a-balls double act again) covered with butterfly netting forms a generally formidable barrier but I’ve noticed that once certain plants increase in size and touch the top of netting, those crafty old cabbage whites settle on the net and lay eggs onto the leaves. 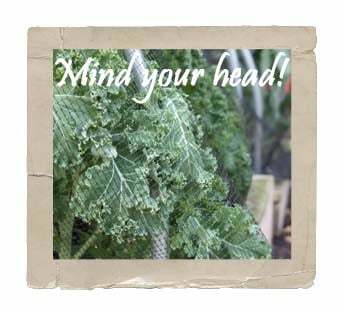 Not keen on watching my brassicas stripped before my eyes, I’ve been burning the midnight oil once again and come up with an increased height cage which gives growing clearance of 1.5m, a 30cm jump on the current 1.2m afforded by our aluminium vegetable cage kits. This should give the taller growing brassicas such as sprouting broccoli a chance to stretch their legs and I’ve already reserved a space in our new catalogue for this extra height cage next year! Not a Berry Good Show! Regular readers of my updates will know just how much I look forward to adding a just picked selection of fresh garden berries and currants to my summer breakfast bowl – and although I’ve had plenty of raspberries, loganberries, blueberries and blackcurrants to give my cereal a kick, it’s been an undeniably barren year on the strawberry front. I’ve got a few theories as to why my cereal has lacked that unique just-picked flavour of fresh strawberries – lack of rain, for example – and I’ll certainly be looking to introduce a ground level watering system to the strawberry mini-raised beds next year, but I think the main reason is a distinct lack of bees. I may have been a touch premature draping the anti-bird netting over my strawbs as there certainly weren’t any developing berries in place when I decide to cover up, and the 20mm mesh of the very efficient bird netting may well have steered a few jumbo bumbles off course. I’ll be more patient next year and maybe my breakfasts will regain their strawberry zest! Are you one of the huge number of gardeners who have got a few tomato plants growing in their greenhouse or on their patio? 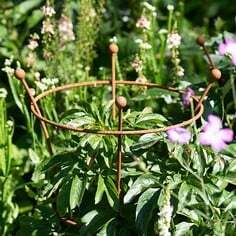 If so, you’ll know all about the difficulties of supporting the popular – and space saving – varieties and probably suffered the heartbreak when a home-made, string or bamboo cane-based system breaks under the strain of a fruit-laden plant; especially if you’re growing beefsteaks! 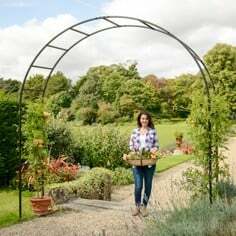 Not having been there myself but with no wish to experience this tomato torment, I’ve devised a greenhouse frame using the redoubtable aluminium tubing and build-a-ball duo which means I’ll get the max from my well supported plants this summer. I’m rightly proud of my greenhouse system; it utilizes the full height of my greenhouse, looks the part, is simple to assemble and take down at the end of the season and was quickly and expertly installed by Head Gardener Dave, who is usually found tending the formal gardens around Stephanie’s Kitchen Garden. 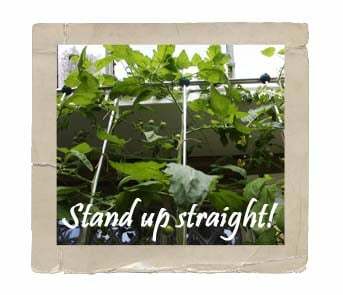 With the heavy crop of tomatoes proving the perfect test for my Tomato Support Frame, I’m bullishly confident that you’ll be seeing the system in a Harrod Horticultural catalogue very soon! Apart from enjoying a day pass into Stephanie’s Kitchen Garden, Head Gardener Dave, the tenacious tender of the formal gardens surrounding my fruit and vegetable growing area, has taken on the task of revamping my composting area. 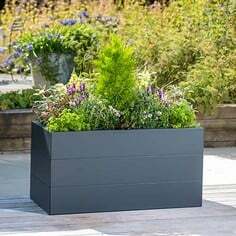 With a storage shed for all the wonderful – and occasionally weird – gardening accessories Courtney and I have got to test high on the list of kitchen garden priorities, I’ve had to streamline the selection of compost bins I use. 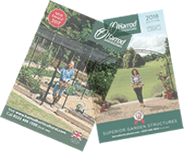 With space an issue – in which garden is it not? – I’ve settled for my new look composting line-up, which features the in-form 635 Litre Compostumbler, a new kid on the block in the form of the Aerobin (debuting in our autumn catalogue) and the tried and trusted 220 Litre Compost Tumbler. Although the hot summer weather has curtailed Dave’s lawn mowing activities, he’s not been able to put his feet up! He’s busy trying to make the various trees, bushes and shrubs around the garden more comfortable with mulching and watering, and has even found time to carry out a little light summer pruning on the apple trees, mainly removing water shoots and channeling the trees' concentration into fruit production. I’m leaving Dave and trainee horticulturalist Courtney holding the fort as my search for new and ground-breaking gardening ideas continues, and the latter will certainly have her hands full – quite literally – with the regular harvesting of courgettes, squashes, potatoes, carrots, spinach and many other flourishing summer vegetables; and that’s before the runner beans come on line! 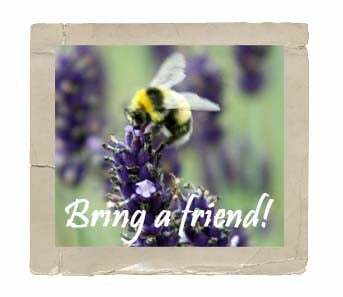 Like you, Courtney’s got our garden Pest Control expert Julian Ives (simply drop him an e-mail) on hand to solve any summer pest queries you may have and hopefully, his input will help you enjoy summer in the garden!